Last week when I took my walk at Howard County Conservancy’s Mt. 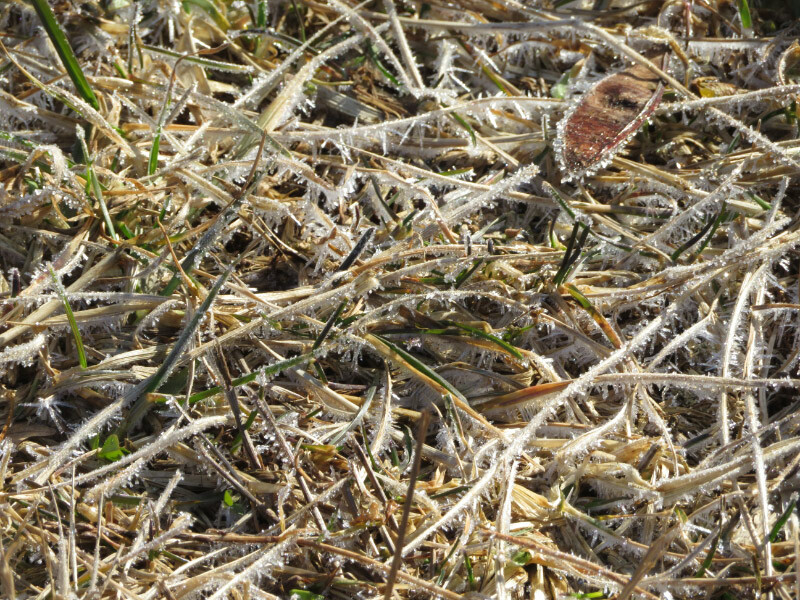 Pleasant Farm, there were ice crystals all over the grass on the paths. It was early enough in the day that the sun had not been out long enough for the ice to melt completely. The ice was in feathery crystals along the stems. When I got to the bridge over the little stream near Hodge Podge Lodge, the moving water looked on the verge of freezing; the places that were shallow and slow over rocks has crystallized overnight. The largest crystals were on some straw near the skunk cabbage. They make the straw ‘fuzzy’ although there are some that look like nodules too. In one place the ice had melted but there were lots of tracks – deer and human! It must have been wetter when they came through since I did not leave any tracks at all!